Another Friday has arrived and, as usual, it’s time for another installment from my Framed Series. Today’s lively series of photos comes from Ellen and Josh’s wedding from a few years ago. This moment is still one of my absolute favorites and I’m happy to share it with you today. So, the wedding day went beautifully. We married this beautiful couple, got portraits done after the ceremony, and moved on to the reception. Now, if you’ve ever been to a reception, you know that they are pretty much the same and there’s not a lot of action like the rest of the day. Well, in most cases, you would be right however, this one was a bit different. I didn’t know until about 5 minutes before this happened, but the wedding party had arranged for the live band to learn Uptown Funk and the wedding party was going to do a choreographed dance to kick off the night. I thought this was an outstanding idea and quickly tried to find the best vantage point before the festivities began. I knew that as soon as the wedding party started doing their thing, the dance floor would get surrounded by guests — making photos nearly impossible. I needed a higher vantage point to see over the people. So, when no one was looking, I jumped up on a nearby table (not one used for the reception), and dialed in my settings. No sooner than I had done that, the music began and the doors flew open. That familiar sound of Uptown Funk filled the air and the wedding party moved in one big mass through the crowd and towards the dance floor, but the bride and groom were nowhere to be seen. 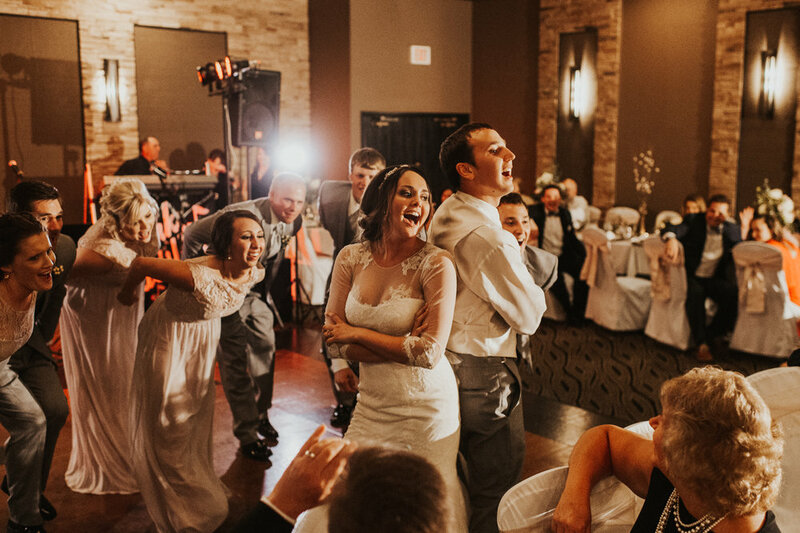 Upon arriving to the dance floor, the wedding party split and out jumped the bride and groom ready to lead the song. The choreography was amazing and moved in perfect sync with the music. 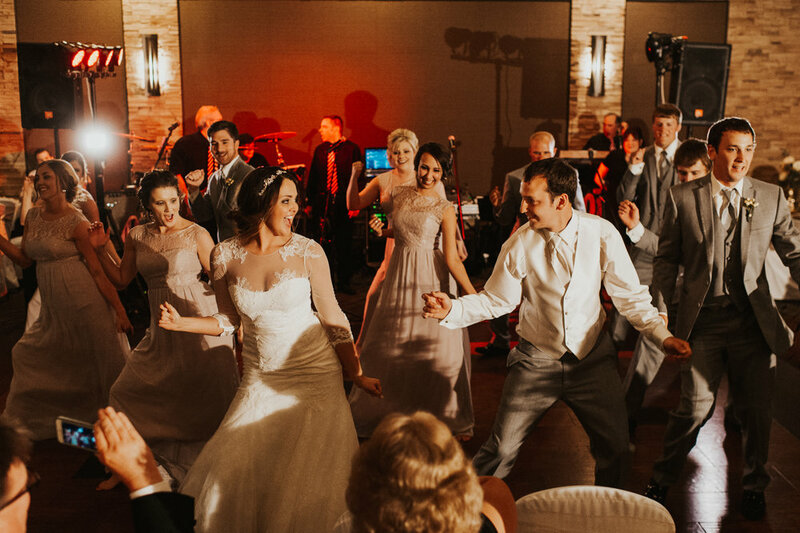 The energy in the room was dialed up to 11 as nearly all the guests jumped out of their seats to clap and dance to the song….most rushing the dance floor. The dancing continued until the song began to wind down where Ellen and Josh came together, stood back to back, and then spun around for a kiss right at the end. This moment was so awesome and I am a huge fan of couples that really go outside the box like this to put on a show for their guests. I can’t remember the last time I had so much fun during a couple’s grand entrance, but then again…who knows what may be coming in the future.